The North East Folklore Archive, an internet resource established by Aberdeenshire Council for the study of the cultural heritage and traditions of North East Scotland. Last updated 29th July, 2015. New feature. Aberdeenshire Museums 'Object Of The Month'. Click here to see this month's object. New for schools. 'Ceilidhmakers' music and song making project. Click here to find out more. The 'Hard Vrocht Grun Resource' is here! Aberdeenshire Council's education resource about the effect of the First World War on NE Scotland is now available on this site. To download the resource please click here. 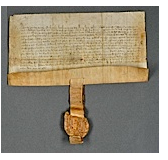 New for schools: 'Aberdeenshire Charters' - The ancient documents with study guides and lesson plans. Click here for the Charter lessons pages. 'The Diary of a Greenland Voyage, 1896' With ever growing interest in the career of the Peterhead whaler 'Polar Star' we have uploaded the diary of a voyage to the Greenland Sea kept by Peterhead sailmaker William Rennie Forrest, who carried on as a crewman aboard the ship after her sale and transfer to Dundee. After a long time searching we have at last found a ship's portrait, and a fine one it is too, but that's another story! 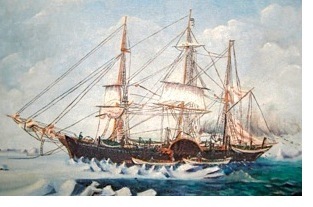 Click here to read Forrest's account of the voyage. 'The Ledger of The Polar Star.' A study of the famous Peterhead whaling ship and her career at the port based on the owners' accounts ledger. With biographical notes and family photographs. Click here to read the story so far. Are you researching family history? Click here for a guide to helpful information resources. Aberdeenshire primary schools have been invited to make contributions to nefa jnr. Rosehearty open this new chapter with the tragic story of 'Poor Mary', a young girl from Glasgow who was evacuated to Rosehearty during World War II. Click here to read the story of 'Poor Mary'. 'Paper Treasure' research resources and task sheets for schools now online! Click here to find the 'Paper Treasure'. Focusing primarily on the North East's farming and fishing communities, the substance of the Archive includes written articles, recorded interviews, biographical notes, photographs, diaries, songs and tunes. Aberdeenshire Primary Schools' very own corner of the NEFA web site. This website has been online since December 4th 1999. Click below to find out more about its history and future plans. Keeping you up to date with what's been happening at the Archive and Arc Studio. ARC Recording Studio, a 32 track digital audio recording facility, occupies the ground floor of the NEFA building. Click below to find out more.